TallyERP.9 Release 6.0 comes with GST (Goods & Service Tax) features, this release is fully integrated for all GST compliances. But the main setup is GST (Goods & Service Tax) setup in Tally. 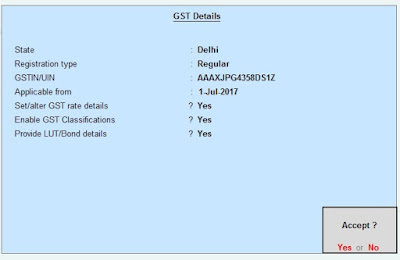 Enter State, Type of dealer, GSTIN No., Applicable from the date, GST rate details, Classification and Details of Bonds if any. Now Press Enter to Save. 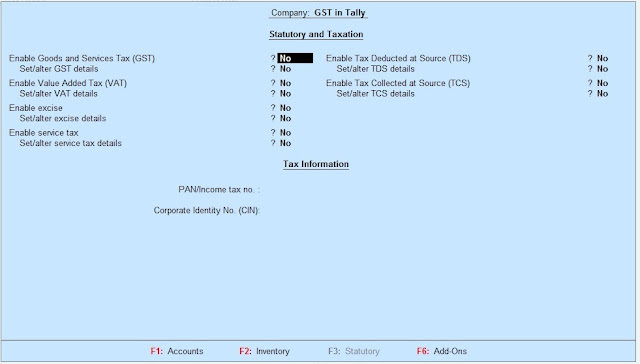 Another Tax Setup options are Vat, Excise, TDS, TCS. Rest will be setup as same as in earlier Tally Versions.